Belfast, Northern Ireland is a restless place. It struggles, like the rest of the country and the UK, of which it’s a part, with a failing economy and severe unemployment. But we think it’ll be one of the next, best tourist destination when Ireland gets its economic house in order and resumes its growth. Belfast’s rain drizzled streets are still dotted with classy restaurants and lots of shoppers. And the arts flourish here too. The majestic Grand Old Opera House has been providing laughter, tears and applause since 1895. An architectural gem, it was badly bombed in “the troubles” in 1991-2, but it’s the best surviving example in the United Kingdom of the oriental style theatre architecture. A “must see” is St. George’s Market where the foot-thumping, sometime heart-rending music is so very much part of Belfast, as are the stalls overflowing with Northern Ireland’s best pates, breads, cheeses and produce. But most of all you have to take the Pub Tour. The pubs of Belfast are not the smoky places of old films and Irish legends. In fact, smoking is banned in the pubs! But they are the pride of the city in many ways. They’re great meeting places, fostering community and full of very funny, witty people drinking exceptional beers and ales, even as they grumble about their politicians and the economy. 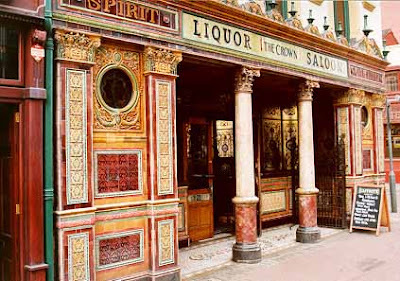 Start with a drink at the Crown Liquor Saloon, a Victorian gem of a pub, perhaps Belfast’s most famous and beloved. Be sure to visit on a Friday night for an evening of Belfast Blues. And the there’s Kelly’s Cellar maybe the oldest pub in town and where Brad Pit came to learn Irish. Belfast is awash in historic, lively pubs and the best way to appreciate them is to take a Pub Tour. Or just wander the city, get good and lost, and thirsty! Next Article Next Article Is Your Baby Safe Flying?